Good things happen every day: Flowers bloom, children giggle, kinds words are said and received, awards are given, projects completed, goals accomplished, high roads are taken, joy is spread, and rainbows streak the sky after storms. 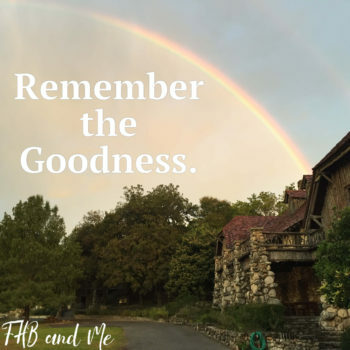 And we think we won’t forget, but sometimes, when the pain, overwhelming issue, negative thought, or aching heart is staring me right in the face..I struggle to remember the good. and the growth from the rain can be hard. Finding a way to hold on to that GOODNESS and JOY, so we can see it through the rain, is key to living our lives in full bloom. Growing up, my mother would find rocks, frogs, and bits of anything and everything in my brother Matt’s pockets while doing laundry. If he found something that brought him joy in his daily adventures…he tucked it away for later. Another friend would also use rocks to mark her accomplishment of making it up HELL HILL Each time she made it down and back up to the top…she would place a rock on a fence. I love her comment about the last stone showing how REALLY HAPPY she was to be done! Go TAMIE GO! That line of stones showed her how far she had really come and what she had done that day! But not all of our accomplishments, joy,or daily goodness is as tangible or visible as rocks to pile up, or awards to place on a mantel. Sometimes it looks like the anger you didn’t use, or the kind words that were said, or the friendships you made, or the song that was sung by the campfire that night. Recently over 100 amazing and creative women and I got a big taste JOY at Lucky Star Art Camp. For 4 days we were encouraged to drink in the goodness and be filled to the brim with whole food, creativity, fireside chats, and so much more. But all good things come to an end, and one by one we journeyed back to our homes. -One made place to hang all of the encouraging notes that were dropped into her goodie bag over the week. -Another made more art projects that were inspired by the classes she took. -And others created beautiful doodles in their art journals, posted pictures to social media or wrote blogs about their experience. Have you ever been somewhere or had an experience that you wanted to somehow capture the feeling and keep it with you always? Frances’s place of joy was at her Summer home in Kent England, The Great Maytham Hall. It had walled gardens and plenty of bedrooms to host her friends for days of endless fun. It was place of pure joy and merriment for she and her guests. It’s like keeping a “happy thought” of of their time there together tucked away for those times when they are in desperate need of sunshine. that there is hope in the midst of the storm. If you want to play the guitar….have it out of it’s case ready to play and place it right where you spend most of your time. So here is a fun idea to bottle up the GOODNESS that comes each day so you can pull it out when you need it most! Find a Jar…any size will do..and if your joy spills out(how awesome would that be)…you can always get a bigger jar! NOTE: Use a clear container so you can SEE the GOODNESS inside! Keep fun sticky notes or paper right by the jar with a pen, colorful markers and more! Drop your daily joy into the jar each night! WHAT COULD YOU DROP IN THE JAR? Prayers answered, breadcrumbs found, light revealed. That time you held your tongue or temper, felt the sunshine on your face or used your gifts for good! Any little nuggets and new signs of life around you. That funny thing that kept you giggling to yourself all day. Words sent via text or social media that lifted your spirits, made you smile. That time you did something scary and survived. -Concert Tickets from a night with old friends or corks from wine shared by the fire with new ones. -Rocks found on a peaceful walk. Merry leaves you found in your yard. Trinkets that hold a good memory. -A penny for each workout or creative project accomplished…or each time you told that inner critic to hush up! THE ONLY RULE IS: If it brings you JOY or reminds you of GOOD-ness: Drop it in the Jar! No room for a jar? Write them in a journal, pin them to a cork board, paint them on a canvas, or create a Happy Place picture like I did here….whatever works to help you KEEP YOUR JOY OUT and ON DISPLAY where you can see it all the time. even when we are running on empty. Hold on to your joy. Find a place front and center so you can see it…even in the rain. What things could you put in your JOY JAR or pocket today?? Lately, I am pocketing YOUR WORDS! As I write, I am doing my best to not look at my blog statistics. Instead I am POCKETing the kind words, texts, and messages you are speaking to me directly and keeping them there for those times when I struggle to keep up with the words…or to find the words… or to remember why I am doing this in the first place: To impact just one woman who may need to hear our message today.